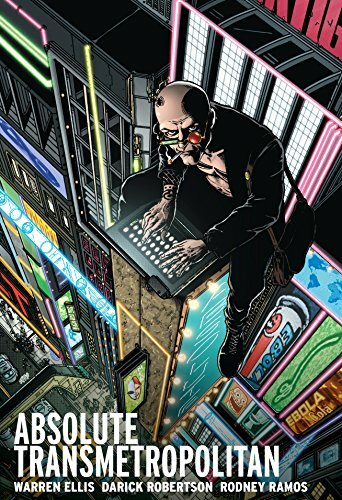 After years of self-imposed exile from a civilization rife with degradation and indecency, cynical journalist Spider Jerusalem is forced to return to a job that he hates and a city that he loathes. Working as an investigative reporter for the newspaper The Word, Spider attacks the injustices of his surreal 21st Century surroundings. Combining black humor, life-threatening situations, and moral ambiguity, this book is the first look into the mind of an outlaw journalist and the world he seeks to destroy. Collects Transmetropolitan #1-18, Transmetropolitan: I Hate it Here, VERTIGO Winter's Edge #2 in a slipcased Absolute Edition format. If you have any questions about this product by Vertigo, contact us by completing and submitting the form below. If you are looking for a specif part number, please include it with your message.